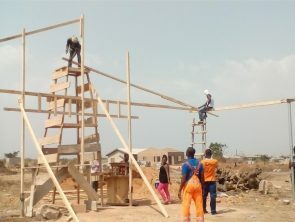 The Higher Glory House Ministry is excited about the progress of its building project at the land site located at Katamanso in the Greater Accra region of Ghana. As previously reported, work has commenced on both the church building and the adjacent parsonage. Click here to see new photos showing roof trusses being constructed on-site and put into place. At this point in time roughly half of the roof trusses are in place. 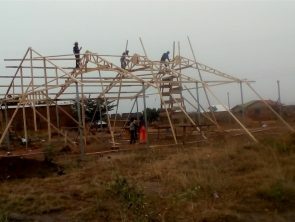 With the rainy season fast approaching, it is critical to put some roofing sheets over the trusses to protect them from deteriorating, as prolonged exposure to the harsh weather could also cause warping. 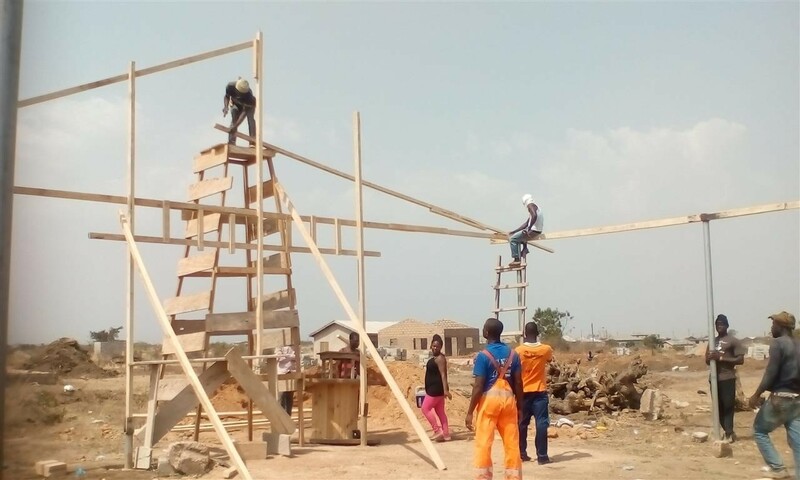 Rather than pre-pay another year’s rent at their current location, Pastor Padi and his fellowship’s hope is put all their resources into at least getting a covering so that they can begin to meet on-site while they continue to raise funds to complete the work. Your prayers and financial support in this regard will be much appreciated. The estimated cost to complete the entire structure is roughly $7,000.00. 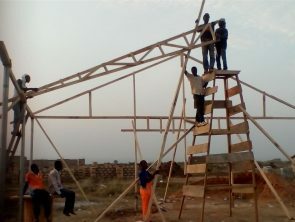 To just put up the roofing sheets so that they can begin meeting onsite is probably more like $1,500.00. If the entire project were funded in full, it would probably take 7-8 months to complete the work. When completed, it is anticipated that the building will be 70ft long and 35ft wide with a seating capacity of about 160 to 180 people. One of the nice things about their location is that it is in a new development that does not have many churches. The traditional leaders mentioned this in giving them permission to build. Thus the location is not only reasonably convenient to the current congregation, but also presents a good opportunity to broaden the fellowship’s reach. Do keep this work in prayer and feel free to contact Lawrence or Steve with any questions you may have.